“Mona Lisa” can sit aside for the time being. Why so? Well, her painter was not only a genius with pure artistic sensibilities, but also a man with ‘hip’ designs that were far ahead of their time. Yes, we are talking about Leonardo da Vinci’s inventions, and how they incredibly mirror many of our contemporary contraptions. So, without further ado, let us take a gander at the eight amazingly inventive designs of Leonardo da Vinci that have modern-day counterparts. Note – Most of these inventions unfortunately remained conceptual in their scope – with detailed sketches and notes in the renowned Codex Atlanticus. 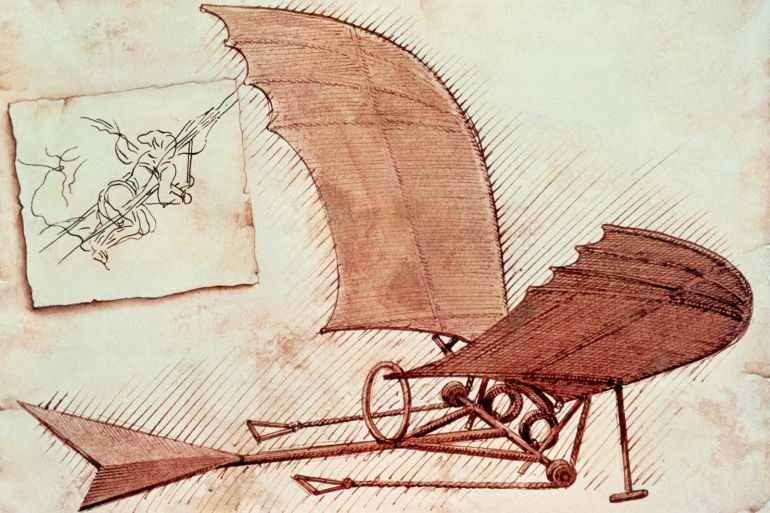 Arguably the most famous of da Vinci ‘hacks’, the flying machine (or the ‘ornithopter‘) was basically envisioned as a wooden frame with two extending wings that amounted to a wingspan of more than 33 ft. This core frame was to be built from lightweight yet sturdy pine wood, while being draped in raw silk to add to the ‘feathery’ equation. As for the powering mechanism, the conceptual design boasted of a rod-and-pulley system that would have controlled the wings while the pilot put his effort into the pedals (bolstered by a hand crank that could increase the energy output). The pilot could also steer the contraption via a head piece – an unenviable task as demonstrated by one of the levels in the video game Assassins Creed: Brotherhood. In any case, what separated the Flying Machine from modern aircraft is its lack of an engine mechansim. So, in other words, while the ornithopter could have flown in mid-air, it would have been certainly difficult to firstly get the machine off the ground. During the late 15th century, canons were mostly of rudimentary make with their antediluvian mechanism allowing for very slow rate of fire. Leonardo da Vinci did observe the tactical predicament, and as a solution contrived the 33-barreled organ. In essence, the multi-barreled device was envisioned to have 33 different small-caliber guns that were to be arranged along 3 rows (with 11 guns each). This so-called ‘organ’ (resembling the pipes of a musical organ) was then to be supported upon a revolving platform that could also be mobile due its wheels on each side. It is rather interesting to know that the seemingly similar volley gun was actually in usage in variant forms even before the birth of da Vinci (like the ‘Ribauldequin‘ used during the Hundred Years War). 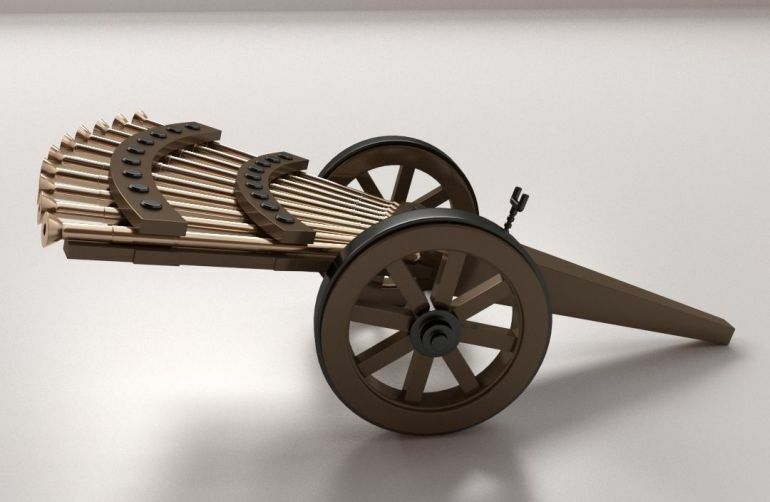 However, da Vinci’s 33-barreled organ was more akin to the 19th century machine gun models – like the Gatling gun that boasted of higher rates of fire without the problem of the barrel getting overheated. If a man has a tent made of gummed linen cloth of which the apertures (openings) have all been stopped up, and it be twelve braccia (about 23 feet) across and twelve in depth, he will be able to throw himself down from any great height without suffering any injury. 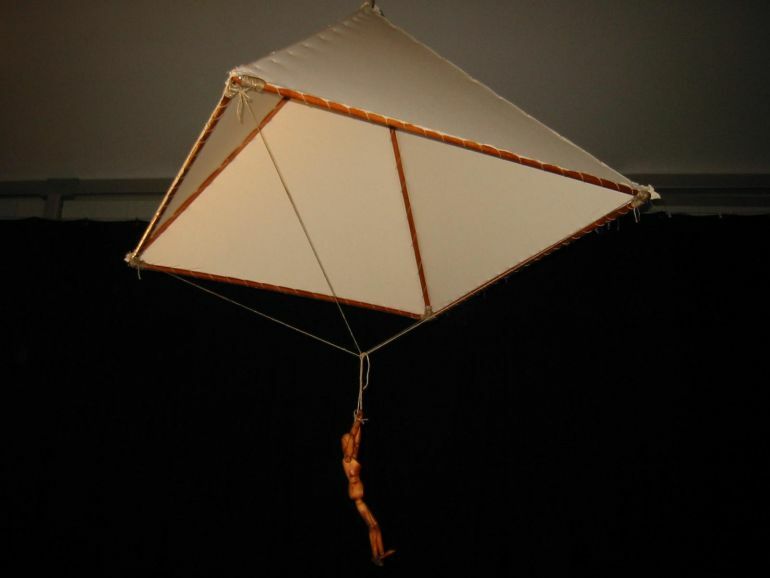 Quite interestingly, a man named Adrian Nichols decided to test out da Vinci’s conception by crafting an actual physical version in accordance with the 15th century renderings. The resultant contrivance was successfully made airborne in 2000, with Nichols singing praises of its efficiency in dealing with air resistances. Certainly a precursor to our modern-day automobiles, the Self-Propelled Cart is also unique due its ‘robotic’ credentials that pertained to pre-determined steering features. 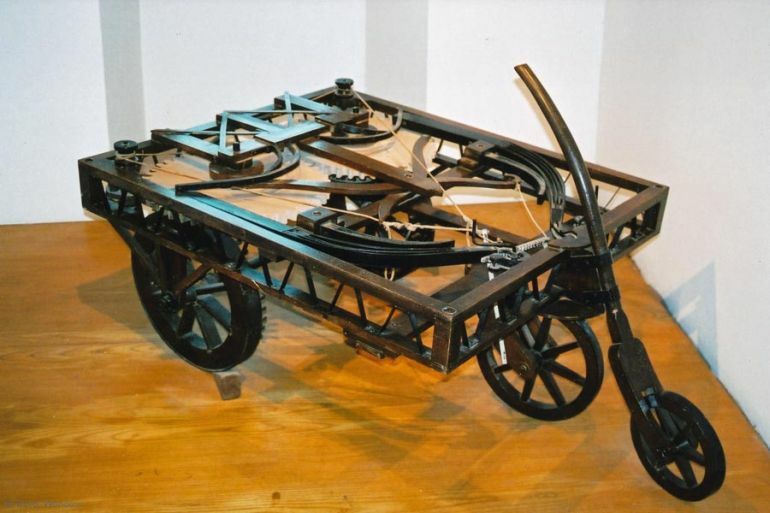 To that end, the advanced cart was envisaged to be powered by coiled springs, while also having a credible steering mechanism, balance wheel (also used in clocks), along with a braking system. So, when the brakes were released, the cart sprung forth – with the vehicle’s direction being controlled by the programmed steering that could lead the cart in various angles. Once again, the Self-Propelled Cart was re-imagined in our contemporary times, by some folks over at Italy’s Institute and Museum of the History of Science. 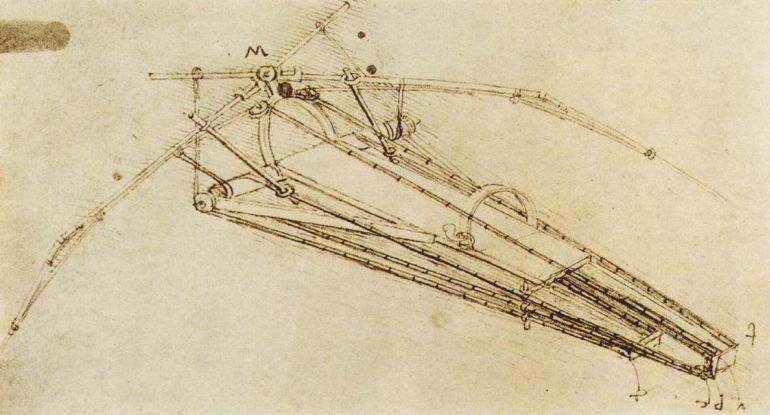 The machine was created by basing its design on da Vinci’s original sketches, and the outcome was pretty surprising. The researchers found out that the furnished vehicle looked much like the Mars Rover, while its navigation system worked according to its conceptualized origins.